There are so many things that drew me to the Blue Pig. I love my bennies and they have 4 on the menu, plus they have a weekly bennie special. We, mostly my husband, love hashes and they had 5-6 hashes on the menu. What pushed me over the top and had me actually making the trek down today was the special of the week. 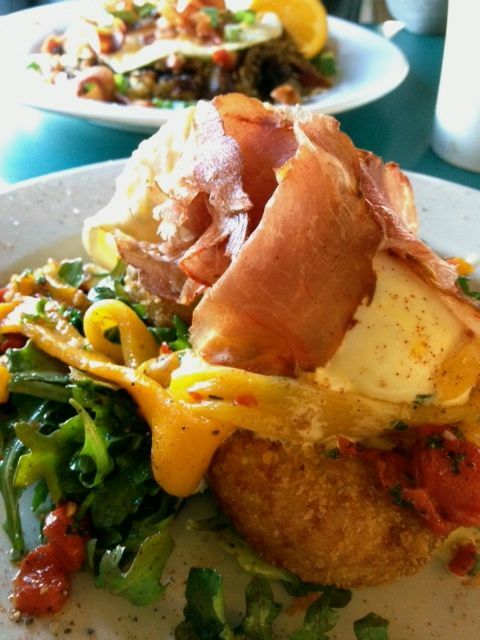 I ordered the special eggs benedicts with arancini stuffed with ricotta salata. I loved my dish. The flavors were amazing, spectacular and awesome. What I didn’t like, and this not the first time I have done this, is that it was way to savory for that early in the morning. It was definitely more of a lunch/dinner meal for me. I cleaned my plate completely, so I wasn’t disappointed, I just wish I would quit ordering that savory at 8:30am. 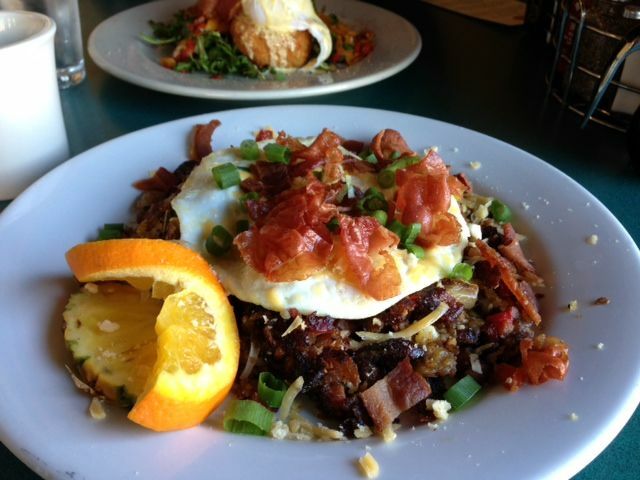 The Savory Hash, also could be known as the meat lovers hash. My husband ordered the Savory Hash, which was also the special of the week. It was a meat lovers hash with bacon, ham, speck and a sausage. He liked it, but he said there was actually too many flavors going on in that meal. Again, we ate it all, and we were not disappointed in it, but it was very savory, just like the title said. Based on the flavor of what we did order, we will be back and we will take it down a notch and order something that is on the regular menu. I also love that they have an early bird special. I was bummed that there were no bennies on the early bird, but there was a biscuits and gravy and the early bird prices were really good. Atmospheres was very open and bright. It had super high ceilings and great artwork, that you could also purchase on the walls. Lots of little tables that could easily be pushed together to accommodate a larger group. Pricing was a bit on the high side. My eggs benedict was $13.75. The others were priced a little better, the portions were nice sized though. The tea was stash, which is not my favorite. Service was great, although it did take our food an usual amount of time to come out, but we had good conversation, so it was all good. The Blue Pig is located on Hawthorne.